When you add up the higher fines, additional driver responsibility fees, the cost of the alcohol treatment and the cost of the ignition interlock device, a person convicted in Michigan of Super Drunk driving is looking at a minimum of $8,000 to $10,000 in fines and associated costs. Add to that the cost of your insurance premiums skyrocketing, plus the huge cost of losing your job (or not finding future jobs), and you are now facing a total cost in the tens of thousands of dollars! We understand that everyone is human and everyone makes mistakes from time to time. And it can be very easy to miscalculate the amount you have had to drink at a party or social event – and end up getting pulled over. But, while some mistakes don’t end up costing too much – a Super Drunk Driving conviction can virtually bankrupt you if it is not handled properly. That is why we urge you to contact an experienced Macomb County Super Drunk driving lawyer if you have been arrested or ticketed for Super Drunk Driving in Macomb County. A lawyer who is experienced in Super Drunk Driving cases will understand the new law and know what to do to get the best possible results in a difficult situation. The amount of alcohol in a person’s body is measured by calculating the weight of the alcohol in a person’s volume of blood. A driver’s BAC can be measured by testing the blood, breath, urine or even saliva. 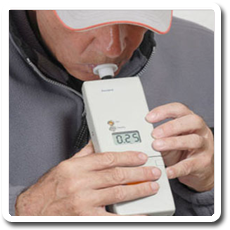 “Breath Alcohol Testing Devices” – commonly called “breathalyzers” – are the primary method of testing used by law enforcement agencies when they are “in the field” (i.e. on the road). A number of factors will influence your BAC level – in addition to the amount of alcohol you have consumed. BAC is also influenced by your weight, how much solid food you have eaten, over how long a period you were drinking, and even your body’s “tolerance” for alcohol. To resume driving after 45 days, a first-time super drunk driving offender must buy an ignition interlock, which tests a driver’s breath, and then allows his or her car to run only if the driver is sober. In addition to being inconvenient and embarrassing, an Ignition Interlock Device costs about $1,000 and run upwards of $100/month to use. The device must remain on the vehicle for almost a full year (320 days). The ignition interlock device requires the driver to provide breath samples when the vehicle is started, as well as at intervals while the vehicle is being operated. Further, the new Super Drunk Driving Law requires vehicle impoundment – even if the vehicle is owned by someone else – if a person is caught driving without the interlock device after being placed on Super Drunk Driving restriction. If you are facing a Super Drunk Driving charge in Macomb County, you cannot afford to go without an experienced lawyer. Justin Vande Vrede cares about his clients and provides immediate and aggressive defense to anyone facing a Super Drunk charge in Macomb County. He has been able to reduce or avoid Super Drunk driving convictions for many clients who have had a BAC in excess of .17% – saving them the embarrassment and expense of a Super Drunk Driving conviction – and in many cases also saving their jobs. If you are being charged with any Michigan OWI, OWVI or “DUI” – including Super Drunk Driving – call experienced Macomb County lawyer Justin Vande Vrede today to understand your options and get the best possible results.